The Aye-Aye. Also known as Daubentonia madagascar-iensis. This creature is peculiar, even by the lemur’s standards of peculiarity. It has a distinctively slender and very long middle finger used to seek out grubs and other possible food sources from tree trunks, like a woodpecker. They have dark brown or black fur that can have white flecks at the tip. 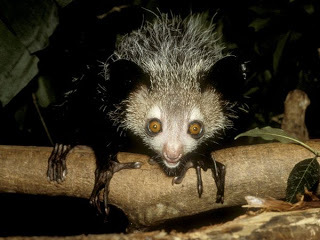 The Aye-aye’s tail is much longer than its body in a way that frustrates our expectations for proportion and, well, let’s just say the eyes are intense. 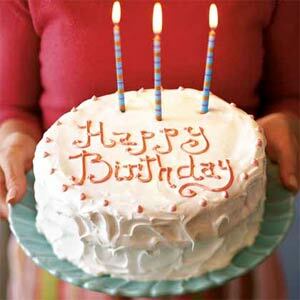 Happy Birthday, BHL! Three years ago this month, the Biodiversity Heritage Library began scanning books aimed at increasing access to the world’s vast array of biodiversity literature. While the word “dent” may be too strong to describe our goal of 100% completion of the universe of biodiversity literature, as you can see below, steady growth continues. Back in 2007, while busy working on the repository’s basic architecture, we had 228 items scanned. Roughly 12 and two thirds Traditional Library Shelves. Today’s numbers are a bit more impressive: 2,318 shelves worth of scanned material! Illustrations play an integral role in the work of taxonomists, and they lend a depth, beauty, and sometimes pure romanticism to the volumes containing them. 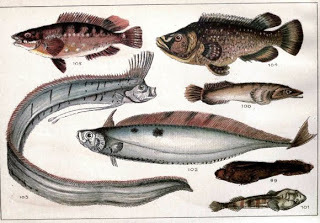 Case in point: this week’s book of the week, Our Country’s Fishes and How to Know Them: A Guide to all the Fishes of Great Britain (1902) by W.J. Gordon. This charming book contains over 30 plates illustrating the myriad of ichthyoids found in Great Britain. Furthermore, the lists of these fish are itemized according to their local and popular names. As the author points out, the purpose of this volume is the “ready identification of our native species, whether sea-water, fresh-water, or estuarine…[and] as the number of species found in British waters is not large, space has been found for a series of short notes…” So, take a few moments to look through the colorful plates depicting the many and varied species of fish found in Great Britain, and feel free to keep a copy of these illustrations for yourself by downloading high resolution images of these pages by clicking on the “Download Images” options found in the drop down menu entitled “Download/About This Book” when on the page viewer screen. Enjoy!